Music is everywhere in Willa Cather's fiction: as a subject, in the background, slyly commenting on the action, connecting characters to a distant world, or revealing their interior worlds. Not merely incidental or ornamental, though, music is intrinsic to Cather's work, a distinctive quality of her creation and expression, and it is in this light that Richard Giannone considers Cather's art. 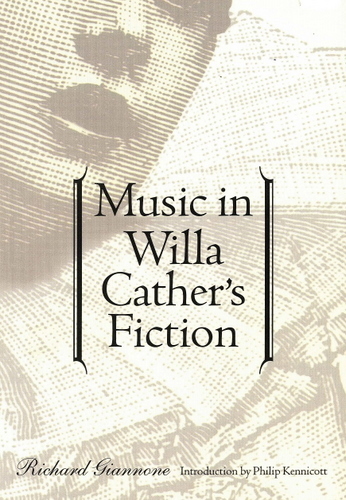 Music in Willa Cather's Fiction is the definitive study of its subject. The first work to examine the complex thematic and structural forms that music acquires in Cather's narratives, Giannone's book uses this musical approach as a way of seeing into the author's artistic sensibility, the evolution of her art, and her total achievement. Progressing chronologically, Giannone shows how Cather's view and use of music changed over time. From what her early journalistic pieces on music and musicians reveal about her attitude and anticipate in her later work, Giannone moves to Cather's early stories to identify the trend of some of her artistic choices, the direction of her stylistic development, and the complication of her moral interest as these are manifested in musical references. In her novels and later stories, he emphasizes the contribution of music to the individual work, as well as the allusions and connections that sound throughout her oeuvre.